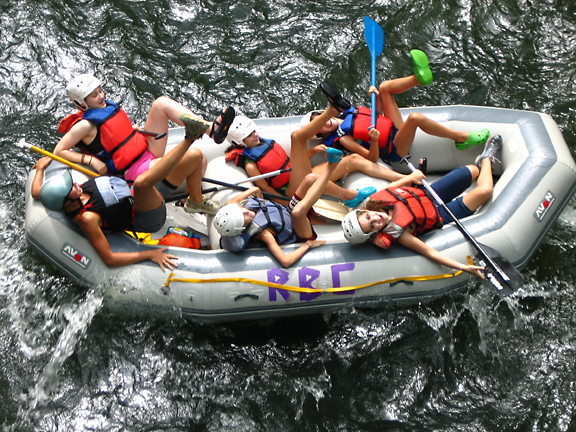 Rockbrook is also a rafting camp! 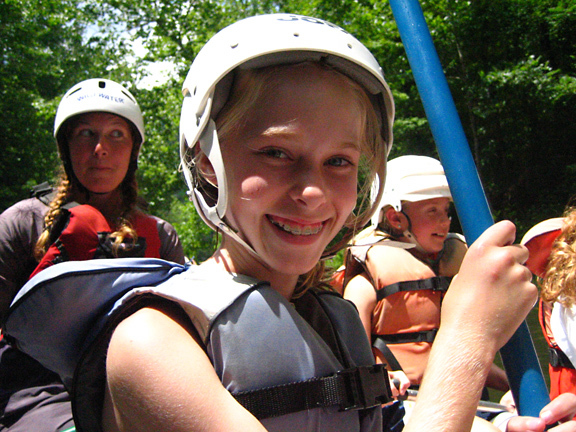 We take every camper who is old enough whitewater rafting on the Nantahala river. 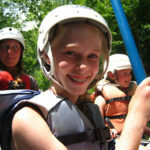 These trips are great whitewater camp experiences with the thrill of rapids, lots of splashing fun and plenty of cold water! The Nantahala rafting camp trips are always exciting because they can also include staying overnight at Rockbrook's Wayah Forest outpost. 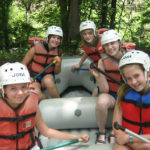 Girls can raft, enjoy the whitewater, and having fun spending the night camping with their friends. With so much going on at camp and with so many people involved, all simultaneously, it’s astonishing to add it all up. While some girls are screaming as they fly by on the zipline, others are silently stretching into yoga poses listening to quiet flute music. As floor looms click back and forth slowing revealing their weaving patterns, pottery wheels spin splattering mud when a bowl forms in the exact center. 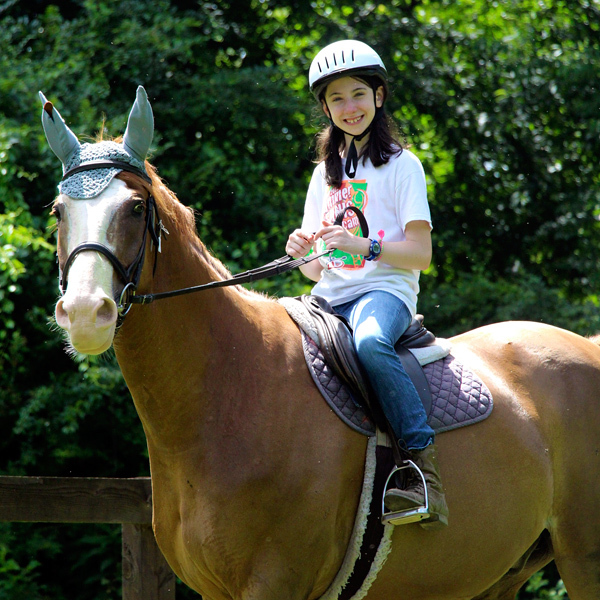 One girl rides a horse and another the water slide. 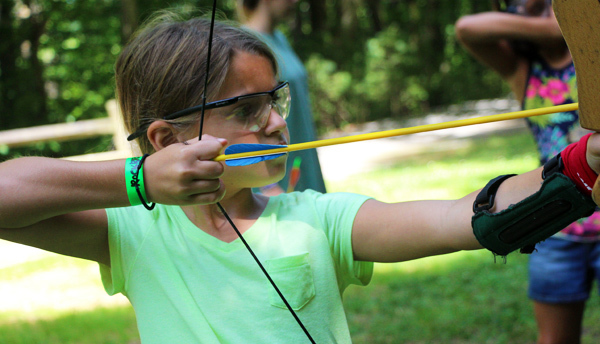 Campers shoot bows and arrows, as well as .22 caliber rifles. They hit tennis balls with rackets and volleyballs with their fists. As some girls tie a figure-eight into their kernmantle climbing rope, others tie embroidery floss into square knots to make a friendship bracelet. Campers are leaping off the diving board into the lake, while others are jumping on the mini tramp to flip in gymnastics. With plenty of tie dyes, paints, markers, and glitter, we have an army of girls happy to add color to just about anything. In these ways and others, camp is an energetic mass of movement, and an awesome swarm of smiling busy girls. “Hey Middlers! Hey Seniors! 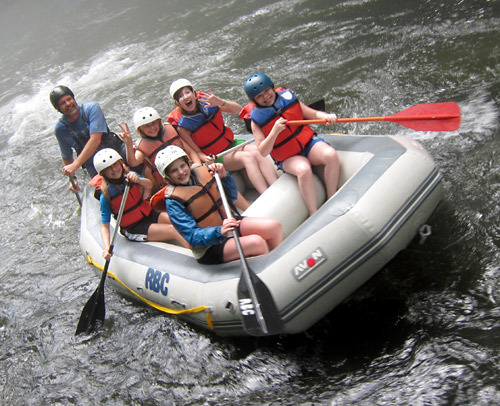 Do you want to go whitewater rafting?” That was the question we asked all of the girls on those lines, and perhaps predictably, about 90% of them said “yes,” with some choosing to do even more by camping overnight at Rockbrook’s Nantahala Outpost. These overnight rafting girls drove over on Monday night and had a great time eating dinner, making ‘smores over a campfire, goofing around in the platform cabins (with a package of glow sticks for each cabin making it even cooler), and simply enjoying this “middle of nowhere” campsite. The next morning, the girls hit the water under bright sunny skies, the perfect weather for a trip down the icy Nantahala river. For several of these Middlers it was their first time rafting, yet almost immediately, even before the first named rapid, they were laughing and squealing with delight. 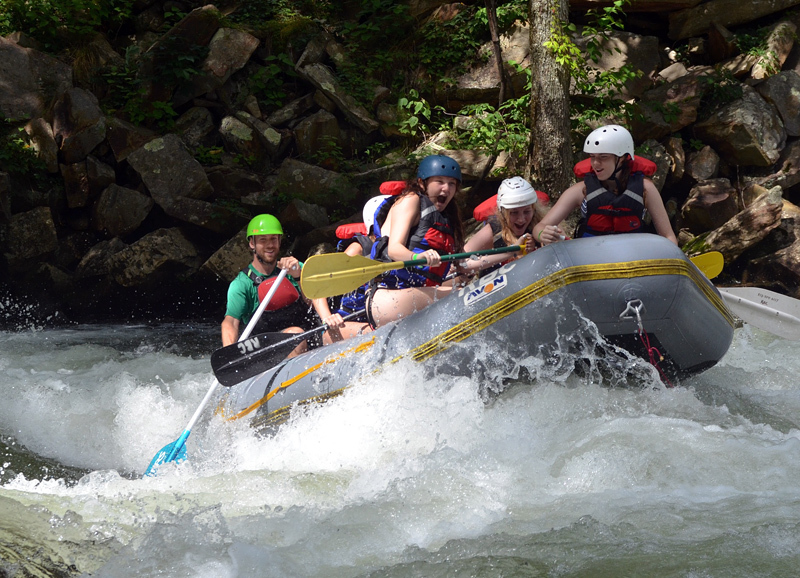 The Nantahala provides a nice balance of thrilling rapids with sizable waves and calm spots in the river where the girls can splash each other and even jump out for a brief swim. I was able to take a little video as a few of our rafts came through the final rapid, the Nantahala Falls (or “Lesser Wesser” as some call it). Have a look and you can see why rafting is HUGE fun! Our afternoon group of rafters, which was primarily Seniors this time, likewise had an excellent trip with hot sunny weather, and just as much high-pitched fun. 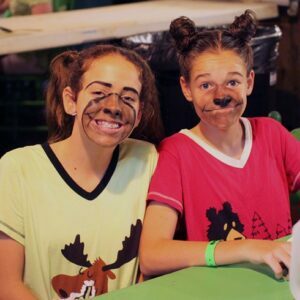 When we all arrived back at camp, a special event dinner was ramping up, a jungle/animal themed meal we called “A Night at the Zoo.” This was a fun opportunity to dress like your favorite animal and have a dinner party singing jungle and animal songs. So tonight we had an entire table of cats, a few butterflies, a squid, a platypus, bears, a turtle, several bunnies, a pink panther (Director Sarah! ), and a whole school of fish enjoying a meal together. Hamburgers, sweet potato fries, salad and watermelon with chocolate chip cookie bars for dessert… yummy and fun! After dinner, during our “Twilight” period of free time (before the start of “Evening Program”), several counselors held a “pet show” on the hill where different girls could show off their “pets.” There were dog tricks, and a super strong rabbit, but the funniest was the gorilla who could do cartwheels. It was all pretty silly stuff, and as that, really great as well. Here’s a little video from our recent trips down the Nantahala. Whitewater adventure at Rockbrook! Tuesday was a great day of rafting for the Middlers and Seniors at camp, including the mini session girls who arrived last weekend. 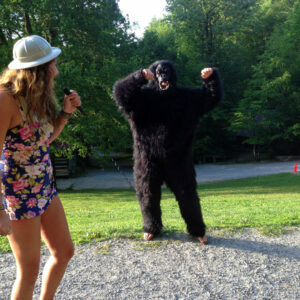 We offered everyone either a day trip or an overnight trip that included staying at our Nantahala outpost. This meant sending one group down the river in the morning, and the second in the afternoon, with the afternoon group spending the night. 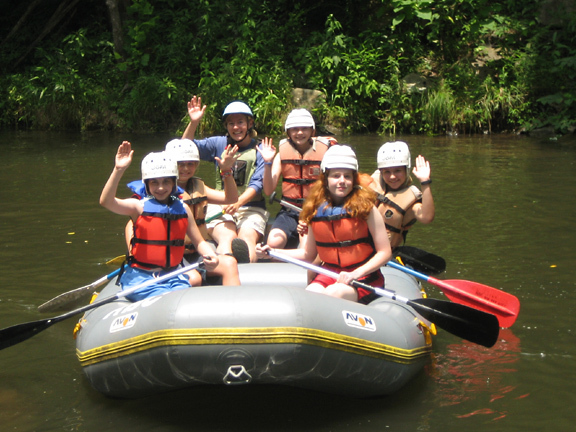 Rockbrook is fortunate to be one of only two summer camps that have a US Forest Service permit to raft the Nantahala River. This means we adhere to the same standards as professional rafting companies in the Gorge, and it allows us to hire our own guides, use our own top-notch equipment and schedule these trips when we need them. Check the photo gallery soon to see more pictures! 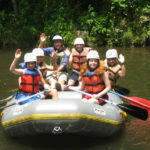 All the Rockbrook campers who are 5th grade and older can go on an awesome whitewater rafting adventure while at camp. 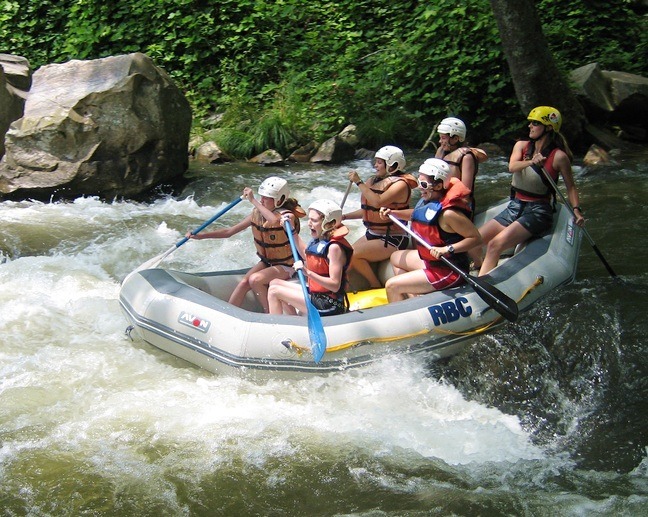 Throughout each session, we take trips over to the Nantahala river, where we are one of the few summer camps holding a permit for these trips (see the ‘RBC’ on the raft?). You have to love this photo and the big excitement on the girls’ faces! Is it the rapid or the cold water? 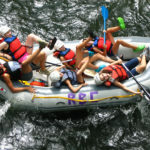 Here’s a set of photos of our whitewater rafting trips on the Nantahala River. 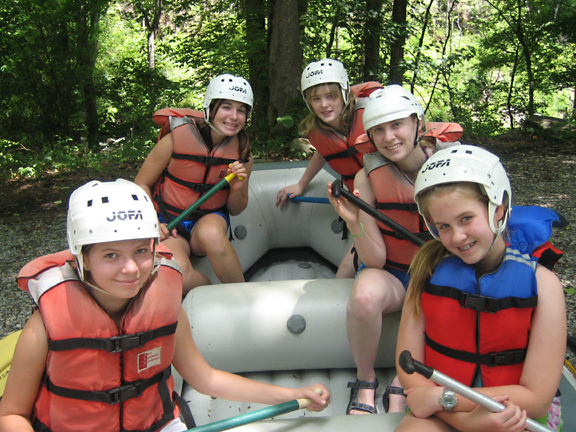 Each session we take girls over to the river for a fun-filled day rafting. The Nantahala is one of the best known whitewater rivers in the southeast and always offers an exciting ride. Check out the photos and you’ll see what we mean. This week we had a marathon whitewater rafting event. Over three days, we took almost a hundred campers whitewater rafting down the Nantahala river. Rockbrook is one of only two summer camps that have a Forest Service permit to raft this river, so we are able to take full advantage of it using our own equipment and raft guides. We also have an outpost near the river where we can spend the night after (or sometimes before) rafting. What a great time we all had— excellent weather the whole time, plenty of whitewater excitement, and lots of fun with the other middlers and seniors. That’s Valerie, one of our former Castle Rock Institute students, guiding the boat. Val now teaches at the Portland Waldorf School. It’s raining, we’re rafting, it’s pouring! Last night was the overnight rafting trip for the middlers and seniors, and I had the opportunity of tagging along! It turned out nothing like I expected! The beginning of the trip was fairly normal. We ate breakfast, hopped on the road, and were way excited for a great time! When we arrived, we lathered on sunscreen, got settled in the rafts and away we went. Yay! The first few rapids were great fun, and when it started to rain we just ignored it, figuring that it would go away in a minute… but it didn’t. Ten minutes later it was still raining, and we were soaked. Not long after that, it began to hail. So we found a place to get out of the river. Our guides lifted the rafts up into a parking lot and leaned them against the fence. They made really great shelter to keep us dry. Then Jeff showed up with the bus!! Yay Jeff! We made it to the outpost without any further exciting events. The night was spent eating pizza and s’mores and was a great ending for the trip! The next morning we hopped in the bus and arrived back at Rockbrook. What an awesome trip! Our first rafting trip of the summer! It was an excellent day on the Nantahala river. There’s Ashley Strickland who came to camp as a junior in 1988 and who has now graduated from college.